Creative Land Design, Inc. provides excellent landscaping services to clients across Wye Mills, Worton, and Stevensville. For over 30 years we have served clients in and around Stevenson, Millington, and Millersville. The beauty of landscaping, to a large extent, depends on the types all features that have been installed there. The area needs to be designed and planned well and all the features need to be installed with care. While there are a large number of companies that offer landscaping services in Maryland, very few adopt the approach that we do. We provide outstanding rockscaping services, which include creating natural stone installations in various areas on the property. Our teams of designers are skilled and creative in their approach to the work which means you get stunning rockscapes that blend in perfectly with the design aspect of your yard and garden spaces. Many homeowners in Maryland have swimming pools on their property. However, our approach to the designing and constructing swimming pools is very different. The features we design are natural swimming pools that often looked like ponds. They lend a very classic and rustic appearance to the yard, turning it into a haven that you can relax and entertain in. As a leading company in this space, we work meticulously that our clients to ensure that their swimming pool design is exactly in line with their requirements. We use various natural elements such as natural stones as well as aquatic plants to create irregularly-shaped pools that look charming and aesthetically appealing. Hardscaping is the foundation of a landscape. The right type of masonry elements can improve the integrity, stability, functionality as well as beauty of your landscape. Since the hardscaping is constantly exposed to the elements, it is crucial to use weather-resistant materials in the work. Whether you will require a patio, deck, a poolscape, driveways, walkways, pathways, we have the right solutions or you. Care will be taken to use materials that blend in seamlessly with the rest of the features in the landscape. We use various materials such as natural stones, boulders, rocks, veneer etc. to create appealing landscapes on your property. There is something very a charming about having a water feature in the landscaping. It lends liveliness and uplifts the appearance of the space like no other feature can. We focus on providing customized designs and solutions. The water feature that our company designs will be unique because it is designed for you. Our focus is always on creating an ambiance that emulates nature. This is why our water features always have materials such as natural stones, bricks and various other elements that are used to create unique designs. 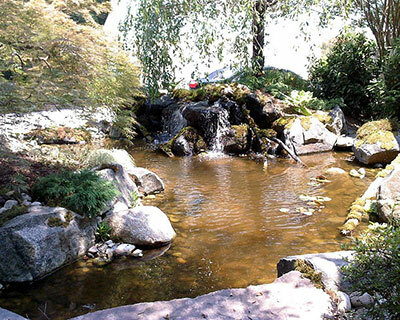 Whether you want a rock waterfall, a Koi pond, a pondless waterfall or just a bubbling brook, we can design a stunning water feature for your property. Regardless of the size of your landscape, its appearance, functionality, sustainability is largely dependent on how well it has been designed and installed. We provide outstanding, customized landscape design solutions to our clients. When we handle any project, you can rest assured that you’re landscaping will be designed keeping in view aspects such as the size of your property, your preferences, the architectural elements of your home, as well as the design of the rest of the features in the landscape. We ensure that the landscape designed has the right balance of hardscapes and softscapes. Our team of skilled and creative landscape designers works very closely to ensure that your vision is brought to life. Creating landscapes is our passion, and we like to build things with a difference. This is why we offer excellent sustainable landscape design solutions. These greenscapes that we design for our customers are unique in every way. We use cutting-edge technology and innovative environmental design methodology to create artistic landscapes that are natural looking and blend in beautifully with various landscape themes. The focus is on building environmentally-friendly landscapes that can provide you with enjoyment for a number of years. We will install dry creekbeds that capture the rainwater from the roof; this will be directed to larger irrigation ponds that can be used to water large landscapes. Retaining walls are a common feature on many landscapes. These walls are specially engineered to provide support to various excavated areas of the land, and they help prevent soil erosion. As with all the other services we provide, our retaining wall solutions are also unique; our creative designers include natural rock and stone materials in the plans. They create plans that include eagle rock garden plants. These retaining walls are aesthetically appealing, structurally sound as well as environmentally friendly features. Lighting is a very important aspect of any landscaping plan. It is important to have well-illuminated outdoor spaces. Not only do these add to the beauty and aesthetics of the yard and gardens, but also improve the security and safety of the property. While proper lighting is crucial, it is also important to ensure that the features installed our energy-efficient. This is why we plan and install low voltage lighting fixtures that include LED lighting etc. We can also include security lighting fixtures in the plan and these can be in incorporated into the broader exterior lighting design. The entire outdoor lighting plan will be designed to enhance the appeal of various features in the yard while creating a welcoming and comfortable ambiance. For any more information about our landscaping services, feel free to contact Creative Land Design, Inc at: 410-758-2455. You can also send us queries via our Online Form on this page. When you hire us, you are assured of the best services at the most competitive pricing.